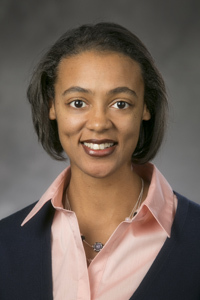 Dinetta Richardson is the Assistant Director for Organizational Development in the Learning and Organization Development department. And Strategic Planning and Implementation. Dinetta's education includes formal training and completion of certifications to improve the effectiveness of classroom and consulting engagements. She graduated from Mount Olive College with a Bachelor's degree in Organization Development. In 2009, she received a Master of Education degree specializing in Human Resource Development from North Carolina State University. Lastly, she is qualified to administer and debrief the following assessments: MBTI, DISC, Strengths Finder, TKI Conflict Resolution, FIRO-B, EQ-I Emotional Intelligence, and Six Domains of Leadership. Her volunteer interests include serving as a career coach and image consultant for Dress for Success; and she currently serves on the Professional Advisory Council for the hospital chaplaincy program.